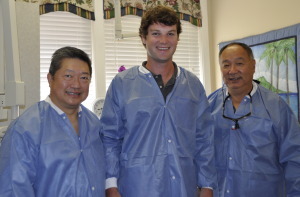 The three dentists who serve the patients of Hawaii Dental Clinic Lanai are Dr. Roger Wong, Dr. Robin Hollon, and Dr. Glenn Kaneda. Our dentists are committed to bringing each and every patient quality care for every dental need from simple routine checkups to placing implants with patient comfort and satisfaction as their primary goal. Roger T.L. Wong, DDS As the owner and senior dentist of Hawaii Dental Clinic, Dr. Roger Wong has made excellence in the dental field his life’s work. He grew up in Honolulu and began his undergraduate education at the University of Hawaii at which time he knew he wanted to pursue dentistry as a career, so he volunteered for the Strong-Carter Dental Clinic (no longer in service). Dr. Roger then transferred to the University of the Pacific in Stockton, California where he obtained a Bachelor of Science degree in Biology. He then pursued his Dental degree at the University of the Pacific Arthur A. Dugoni School of Dentistry in San Francisco. Dr. Roger moved back to Honolulu to open his private practice, Hawaii Dental Clinic. At the time of founding, it was a one-dentist office but through the years, Dr. Roger and his team have grown the practice to accommodate multiple doctors, hygienists, and administrative staff while maintaining the highest commitment to patient well-being and satisfaction. Dr. Roger and his wife Darlene have four grown children and two grandchildren. His oldest daughter, Dr. Lisa Wong, is also a dentist and is his partner in Honolulu. Dr. Roger is enjoying practice here on Lanai as the culture and environment hearken back to the Honolulu of his childhood where doors were left unlocked, there was plenty of available parking, and no traffic. Robin B. Hollon, DMD Dr. Robin Hollon grew up in Mobile, Alabama on the coast of the Gulf of Mexico. After graduating from the University of Alabama with a Bachelor of Science degree in Biology, Dr. Hollon was immediately accepted into the nationally renowned UAB School of Dentistry where he served in various leadership roles for both the school and the American Student Dental Association. Dr. Hollon is currently a member of the American Dental Association, the Hawaii Dental Association, and the Maui County Dental Society to stay up-to-date on the latest dental advances. He loves that he has the unique opportunity at Hawaii Dental Clinic Lanai to treat patients of all ages with a wide range of dental needs and aims to bring his gentle, caring touch into each and every patient’s experience. With a love for the outdoors, Dr. Hollon and his wife Pamela spend most of their free time on the water kayaking, offshore fishing, and spearfishing. Glenn M. Kaneda, DDS Dr. Glenn is a graduate of the University of Missouri-Kansas City School of Dentistry and has been a licensed Hawaii dentist since 1979. In addition to his experience in private practice, Dr. Glenn has worked in pediatric dentistry at the Strong-Carter Dental Clinic and as a military dentist with the Hawaii Army National Guard. Dr. Glenn lives on the Windward side of Oahu and practices on Lanai on Mondays.